Mark, the author of the gospel with this name, was the apostle Peter’s interpreter in Rome and one of his closest collaborators. Early Church writers tell us that Mark wrote his gospel at the request of the Christians living in Rome and that he based it on the preaching of Peter. We are told also that Peter personally approved Mark’s work. To read Mark’s gospel, therefore, is to be drawn to the side of Peter and to experience the person of Jesus as Peter experienced him. Mark wrote his gospel more than thirty years after the death and resurrection of Jesus. Peter had had all this time to ponder what he had experienced with Jesus. Peter had also been at work during all this time doing what Jesus had asked him and the other apostles to do, and that was to preach the gospel. In Mark’s gospel we find Peter’s years of experience distilled for us, his experience of being a disciple of Jesus and a servant of his gospel. And what the gospel reveals to us about Peter is that he was a man who had been deeply humbled by what he had experienced. By the time of Jesus’ ascension and the beginning of their work, all the apostles were well aware of their faults and failings. After the night of his betrayal of Jesus, Peter was especially aware of his. Bearing in mind that it is the voice of Peter that we hear in Mark’s gospel, it is surely important for us to notice that there is no mention, for example, of those texts which speak about Peter’s primacy among the apostles and his leadership role in the Church. What we find highlighted instead are the serious limitations of Peter and the other apostles. In Mark’s gospel the apostles are shown to us as repeatedly failing to understand Jesus; repeatedly failing to believe in him and trust him. If there is one truth Peter came to understand from all that he had experienced, it was his personal need for grace, that grace fully and freely available in the person of Jesus. The person of Jesus presented and proclaimed in the gospels is God’s answer to humanity’s most fundamental need. Jesus is God’s answer to the most fundamental need of each individual, and that is the need for grace. 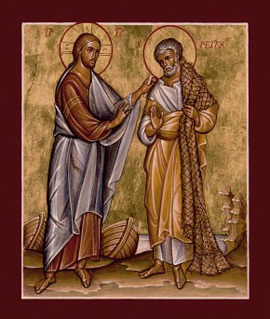 If we are to be attracted to the person of Jesus, if we are to receive what he alone can give and which he is so willing to give, then surely we must be brought to where Peter was brought and that is to an awareness of our own sinfulness, and through it to an awareness of our personal need for grace. It is not without significance that Jesus began his public life with the words, ‘repent and believe’ (Mark 1:15). We never grow beyond the need to take these words to heart. Jesus himself declared that he came not to call the virtuous, but sinners (Mark 2:17). The seeds of God’s grace find their most fertile ground in a broken, humble heart (Mark 4:1-20). God’s grace is at its best in weakness (2 Corinthians 12:9). Welcome to this month’s edition of “Liturgy Notes”, the liturgy and music section of the Faith & Life e-newsletter. The PSALMIST music ministry development program continues to gather pace. More than ten scholarships have now been received. 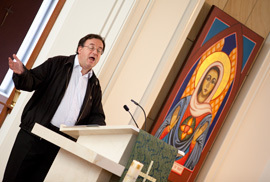 Voice Trainers are now located in every region of the Diocese. There are still many scholarship opportunities available, so please consider applying or suggesting to someone in your parish that they might apply. To enquire, contact me on (02) 4253 0823. The first of this month’s feature articles looks at new music and liturgy resources, including the latest edition of the General Instruction of the Roman Missal (GIRM) for Australia, new hymnals and new psalm collections. The second feature article looks at important changes and new offerings in church copyright services in Australia. purpose and being, while providing a high standard of contemporary, 21st century learning opportunities for our young people. The question is: how can Catholic Schools best respond to the challenges of this New Evangelisation? This question was in part answered at a gathering of over a thousand people; school leaders, clergy and others involved in Catholic Education from NSW and the ACT focusing on the New Evangelisation and the practical implications for our schools and parishes. Archbishop Jean-Louis Brugues OP, Secretary of the Vatican Congregation for Catholic Education was the main keynote speaker. In addressing the changing and contemporary nature of today’s world, Archbishop Brugues warned against the dual ‘threats’ of nostalgia and fundamentalism. It is clear that now, more than ever, our young people need and desire a spiritual identity in a search for meaning and to encounter their God. Catholic educators and the clergy have been given a clear message from the Church hierarchy that in terms of the formation of our Catholic students and the invitation to non-Catholic students to share the wisdom and beauty of the Catholic faith, we are compelled to explore practical and creative strategies to strengthen Catholic schools as centres of the New Evangelisation. I was born in Camden, March 1984. A strong coffee while I share Vegemite on toast with my son. What inspired you into taking on Youth Coordination for the SVdP society? Before I applied for the position of Youth Coordinator I was a member and volunteer of the St Vincent de Paul Society. I experienced many life changing events during this time, both in my faith and my understanding of the world. The youth coordinator at the time was very supportive and encouraged me into positions of leadership and opportunities that I would have not thought possible. In 2005 the St Vincent de Paul Society supported me in attending WYD in Germany 2005. This was my first overseas experience, I was fortunate to travel with fellow young Vincentians, an opportunity that I will never forget. Shortly after WYD 2005 the position of Youth Coordinator became available. I jumped at the chance to work for and learn more about the St Vincent de Paul Society. Also, to provide similar experiences of faith, service and charity to other young people, that challenged and transformed me. My goal was to ensure that the work of the previous Youth Coordinator continued to develop and that young volunteers and members felt supported. Pick three words that describe your life so far? What has been the biggest challenge for you in this role? One of the challenges so far is witnessing someone’s pain and suffering and being limited in how we can be of service to them. Unfortunately we do not have all of the world's resources at our finger tips. The concept of “serving Christ in the poor” (St Vincent de Paul Society Mission Statement) is the greatest challenge to all Vincentians. It reminds us that the face of Christ comes in all shapes, colours, ages and complexities. As I have grown older I have noticed that they have changed. The more that I learn about the founders of the St Vincent de Paul Society the more I admire them and their courage, humility and passion. Both Bl. Frederic Ozanam & Bl. 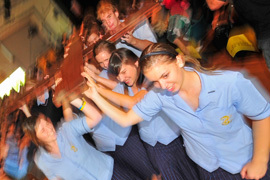 Rosalie Rendu are most definitely in the top five along with St Mary MacKillop, St Bernadette, St Vincent de Paul (patron of the St Vincent de Paul Society). What has brought you the greatest joy in this role? There are several things that bring joy to my role as Youth Coordinator. Here are a few: Young people dedicating themselves to be of service to others; Starting new programs that have potential to bring people love, hope and compassion; educating people on the situations of those that are marginalised, disadvantaged and neglected, then witnessing their passion to want to do something to help. In what ways do you experience God’s grace in your life? Connecting young people with God and active service in their community. Witnessing young people transitioning through stages of faith, from a fairytale love of God to meeting God in other people, then serving God through action on to seeking God through prayer and reflection. I believe the Church is an avenue to grow in love of each other, a source of compassionate unity and charity, especially in times of darkness and despair. We are in the Year of Grace, a time set aside by our Australian Bishops for us to encounter Jesus Christ more deeply. How do we start afresh from Christ and what does it mean to experience grace? The Year of Grace website provides a great starting point. Visually, it offers a range of images of the person of Jesus Christ. The image changes each time you visit. Accompanying this are a series of short, beautiful quotes all centred on the meaning of grace. The site includes a good explanation of the Year of Grace and an engaging video which is well worth sharing at community gatherings. The “Encounter Jesus” tab contains a section on Praying with Icons. People are always delighted when they delve into this ancient form of prayer. At the bottom of this page are two short videos, courtesy of Brisbane Archdiocese, which give good snapshots into how we can encounter Jesus Christ in fresh ways. Best of all, you can register for a monthly e-newsletter which keeps you informed of all the latest initiatives taking place around the country as well as any new updates to the website. What is your life like right now? As you read this are you feeling lost? Or has something happened that has filled you with utter joy? Likewise has something happened that has made you doubt your own worth? Is your past clouding your present life? Have you done something you wish you hadn’t done? Do you want to be free? Which one is calling to you? Whatever one it is, stop reading now and sit quietly for a moment or two. Say those words slowly over and over again. After a few minutes tell God what you are thinking and feeling, then sit silently for another couple of minutes while God tells your heart what He is thinking and feeling. God is always waiting, always desiring to speak with you through his Word. How might you go about hearing this Word in your life? Read a little piece of God’s Word each day. See what calls to you and then write it on a piece of paper and take it with you for the day. Put it on the fridge; maybe get the whole family to do that. What a rich prayerful conversation you could have at the evening dinner table. Take it with you on your morning walk. Have your lunch on your own sometimes and “chew over” the Word given to YOU. Each time you go to the Scripture start with this little prayer “O Lord, show me my own heart that I might know Yours”. Once you get familiar with it, you will engage with it naturally, as one does with the words of a loved friend, and the Word will reveal Himself to you. Let me tell you a closely guarded secret! “God prays with YOUR words all the time”. The words and the silences of those we love mean everything to us and so do yours to God. Therein is the prayer.